CLICK HERE to make a #Giving Tuesday donation to Meher Mount through the PayPal Giving Fund (no transaction fees), and PayPal will donate another 1% to Meher Mount. Your #GivingTuesday donation — and all donations through the end of December — support the daily care and preservation of Meher Mount. Your contribution supports Meher Mount as a medium for sharing Meher Baba’s Divine story with all. Donate through the PayPal Giving Fund (no transaction fees), and PayPal will donate another 1% to your donation. Click here to donate. Meher Baba left an invisible fountain of spiritual energy that touches all who visit. The touchstones of His visit are physical reminders of His presence. They are a connection to Meher Baba’s time at Meher Mount. Your #GivingTuesday donation supports the preservation of these touchstones. CLICK HERE to make a #GivingTuesday donation to Meher Mount through the PayPal Giving Fund (no transaction fees), and PayPal will donate another 1% to Meher Mount. This heart stone marks the spot where Meher Baba sat under Baba’s Tree. Baba’s Tree sits at the brow of Avatar’s Point overlooking the Pacific Ocean. Damaged in the 2017 Thomas Fire, the tree remains in seclusion while it recovers. “Baba’s Tree is as powerful as ever,” said a recent visitor. Your donation supports the ongoing care and protection of Baba’s Tree. Baba’s Fireplace was part of the guesthouse where Meher Baba met with His followers in 1956. The building was destroyed by fire in 1985, but the fireplace remains as a touchstone of His visit. Your donation supports sharing Meher Baba’s life and words with visitors through these touchstones. Baba’s Walkway, the original sandstone path leading to Baba’s Fireplace, has been buried for 20 years. Your donation supports the ongoing work to uncover and preserve this walkway. Baba’s Path is the footpath used by Meher Baba as he strode across the meadow to Baba’s Tree. In photos you see His followers hurrying to keep up. Baba’s Path is kept mowed so that today’s visitors can walk in His footsteps. Your donation supports that upkeep. All of these efforts require resources — that’s why your contribution is so vital to the legacy of the Avatar’s Presence at Meher Mount. #GivingTuesday is a global day of giving when millions of people around the world come together to support the causes they believe in. Celebrated on the Tuesday following Thanksgiving (in the U.S.), #GivingTuesday kicks off the charitable season. 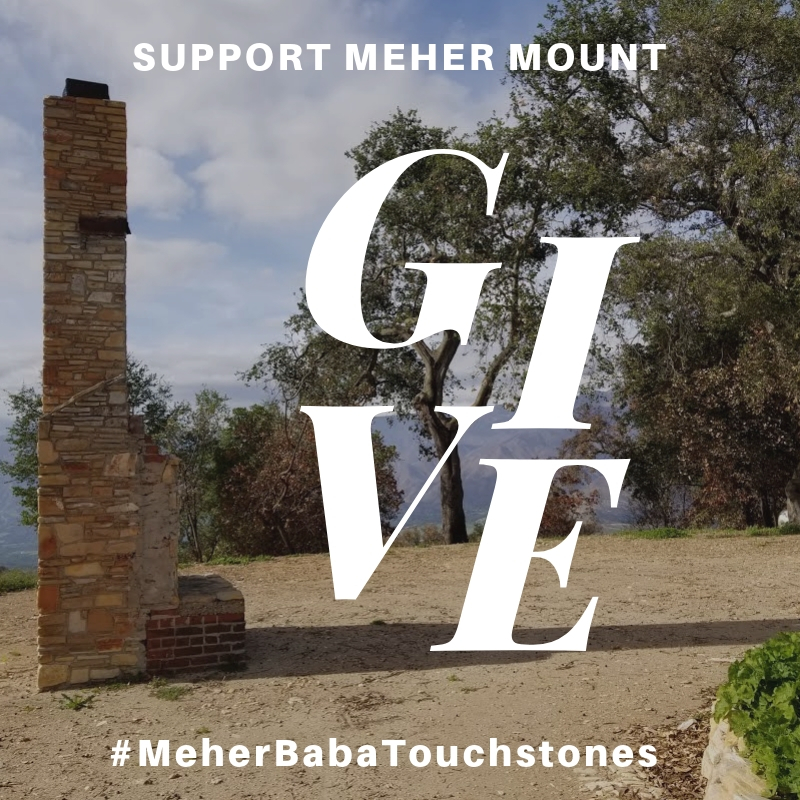 Your #GivingTuesday donation makes it possible to maintain and preserve Meher Mount in honor of Meher Baba. By making a contribution, you provide the opportunity for all to spend time at Meher Mount and be inspired. PayPal adds 1% to every donation from November 27 through December 31, 2018, made through the PayPal Giving Fund. Plus there are no transaction fees. CLICK HERE to make a #GivingTuesday donation for Meher Mount through the PayPal Giving Fund (no transaction fees), and PayPal will donate an extra 1% to Meher Mount. Baba’s Fireplace is one of the touchstones of Avatar Meher Baba’s visit to Meher Mount in 1956.